Spring is in the air! For those of you who are maybe need more convincing that Spring is just around the corner, take a peek at our new Spring and Easter Newsletter, sure to get you thinking springtime thoughts. We have new wafer papers spring, fabulous cupcake decorating kits, clever containers for Easter tables and treats, flower cookie cutter decorating ideas, faberge egg cookie stencils and much more to satisfy your sweet tooth and baking urge! 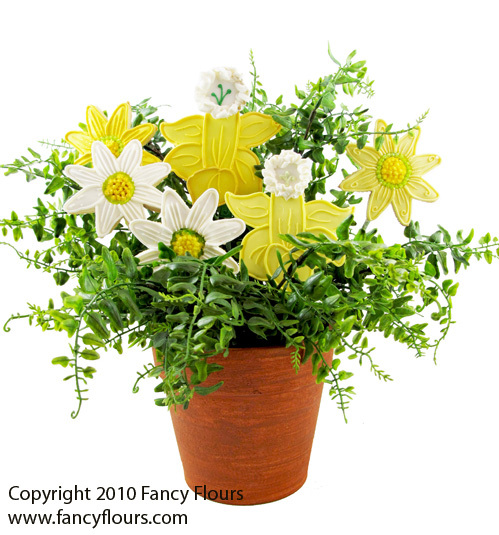 Make this beautiful display of flower pot sugar cookies HERE. View our entire Spring and Easter baking and decorating collection HERE. You can also always view What’s New to our inventory by clicking HERE. This newsletter is online only – you may view from your computer or print at home. This entry was posted in Announcements, Easter Treats and tagged easter baking by Fancy Flours. Bookmark the permalink. Love your sugar cookies! I ordered some for my neices bridal shower and I recently sent my two older children Valentine’s Day Sweetheart cookies and they were a hit. Do you publish your fondant icing receipe or do you sell a book that includes the receipe? I would love to try it. I’ve never worked with fondant.